Razor clams are a lot of work, but well worth the effort! 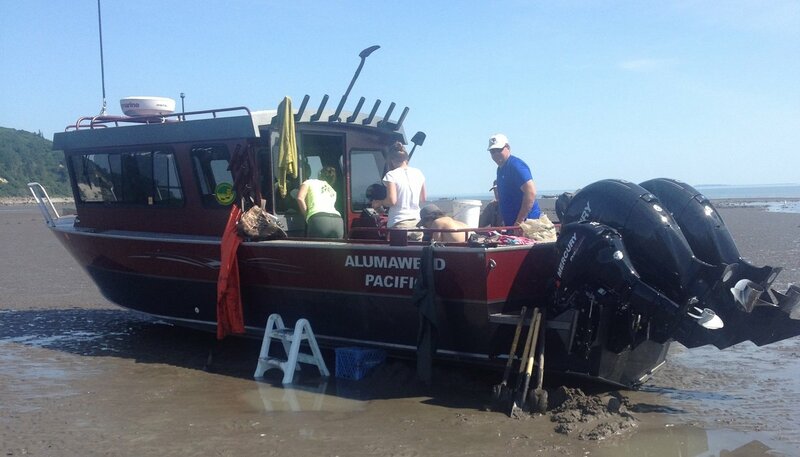 We take our boats all the way across Cook Inlet and beach them on sandbars during certain minus tides.This year, there are no limits on how many clams you can dig, RAZOR CLAM JAM!!! Clam digging requires hip waders or other protective gear, special clam shovels or clam guns and many 5 gal buckets. If your group needs any of this equipment or gear, please call our office in advance of your scheduled trip to reserve equipment. Clam cleaning is NOT included in the charter price. Clam cleaning can be arranged locally for about .50 cents a clam or please feel free to use our facilities to clean your own!